And guess what else? Many of you have asked that I try to experiment and come up with some healthy alternatives to boxes of Rice-a-Roni – and I think this recipe might just meet that need for some of you. When it was all said and done, I thought this dish kind of looked and tasted rice-a-roni-ish. Try it and see what you think. If you haven’t tried making my homemade Onion Soup Mix, I recommend throwing it together to use for this recipe. Store bought onion soup mixes typically have not-so-good for you ingredients in them that I avoid. The homemade mix is super easy and very inexpensive. Place rice in the bottom of a crock pot, and sprinkle it generously with salt. Pour water or broth and cream over the rice. Cut chicken breasts into serving sized portions and place on top of the rice and liquid. Sprinkle Onion Soup Mix over the top. Cook on a low setting for 4-5 hours. Serves 6-8. I have been trying alot of your recipes and I LOVE them! So simple, so natural, sooooooo yummy. Thank you for your dedication to sharing all you do – I always look forward to your stuff. I pinned the recipe too! Okay, maybe this is a dumb question, but you did use uncooked chicken when you put it in there, correct?? I have a dairy-free child. Could I just skip the heavy cream and maybe add a little more water or broth, or does it really add flavor and/or texture to the meal? Sure, you can skip the cream and instead add more water or broth, no problem! Recipe looks wonderful – can’t wait to try it! And pinned it on Pinterest too! This does look good. I think it sounds like a winner for a great Wed night supper! This looks great! I’ll be trying it. Thanks for the info about how to make it dairy-free in the comments. I often skip recipes that say “heavy cream”. I’ll give this one a try! Interesting that readers are looking for a healthy version of Rice A Roni – I make my own, but use Mrs. Dash in it, so I am not sure it is uber healthy, but it is healthier than the box. Does the rice come out gummy? We will definitely try this sometime in the next few weeks. Thanks! Thank you for this…so easy and yummy! Sounds good! I am always looking for more ways to use rice. Thanks! I was trying to decide what to make for lunch today when I opened your site….answer provided! thanks! This looks yummy – and EASY! I didn’t realize I could cook rice in the crockpot that way! I’m looking forward to giving it a try! Thank you! Mmm, looks yummy! Easy recipes that are also healthy are nice to have. Thanks for this recipe. I am anxious to try chicken and rice without the condensed soup most recipes call for. I am going to try this asap!! I was going to have chicken for dinner tonight but hadn’t decided which recipe–now I know–thanks! We are having this for dinner tonight! Just set out chicken to put it in the crockpot and was wondering how to use cream in it. Will also be using white organic rice instead of brown rice because I want to use it up. Thanks! I can’t wait to try it—looks so easy! Recipe sounds great! Can’t wait to try it. And it is gluten free, too! Yay! Looks like a yummy recipe! Can’t wait to try it! Our family has enjoyed so many of your recipes since we started on this real food journey a couple months ago. Thanks! Laura, I LOVE your Creamy Chicken and Rice recipe. This looks similar, but easier for me to prepare on a weekday. Thanks for all you do to help me feed my family!! Thanks so much! I love crock pot recipes! I use many of your recipes, and here’s another one to add to the collection! Thanks! Looks delish! I am going to try it this week! I shared it on facebook. Thanks for yet another easy, family friendly recipe. I like how simple this is! Going to try it tomorrow night…thank you! Actually just defrosted chicken this morning soooo in it goes! This sounds simple and good. Sounds like an awesome recipe! Thanks for the onion soup mix recipe. We have a league of allergies we’re dealing with at this house along with the usual nasties (MSG, etc) we work to avoid. Thanks. Thanks for posting this Laura! I was wondering what was going to be supper tonight and now I have this in the crock pot as i type and it smells amazing!!!!!! I shared this on Facebook today! I can’t wait to try it next week! I definitely needed this recipe. With two in gymnastics, one in preschool, 2 in school, one in baseball, and one in a honorary choir, I feel I am run to death. Add running a business on top of it at tax time — I just want rest from the kitchen. Thanks for the recipe. I will try it next week. We did have it for lunch and it was yummy!! Looks yummy! I can’t have dairy. Do you think it could be made without the cream? Can you replace the cream with Evaporated Milk?? has anyone done this?? I just pinned this. Looks yummy! Thanks. Ths looks delicious! We’ll try this on Saturday! Shared this on facebook. We are having this tonight with homemade sourdough rolls. Thanks for the recipe and the opportunity to win! Making this one for dinner tomorrow! I want to add mushrooms and maybe some vegetables to it to make a one pot dinner. Any idea if I need to do anything differently to do this? I was thinking the mushrooms will release a decent amount of water when they cook down. Can’t wait to try this – it looks fantastic! Thank you for another good home-cooking recipe! This sounds wonderful. I will have to try it this soon. What is that delicious eggy-looking thing on the plate with this? I thinking maybe a corn fritter? 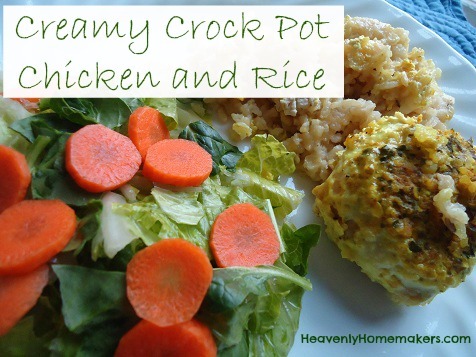 Yum LOVE CHICKEN and a Chicken crock pot recipe on top of that AWESOME!!! Yum! Might have to hurry and get this going right away! This looks great but what type of rice do I use? The plain bag of rice or minute rice type? I used the regular brown rice. Thanks so much for responding to my question earlier. I can’t wait to try this for my family! 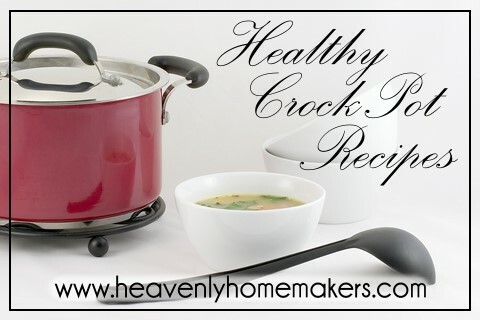 I’m always looking for simple crock pot recipes. A trip “to town” takes at least 2 hours, since we live 30 minutes from the nearest WalMart and 1 hour from Whole Foods. We don’t eat out anymore when shopping. Instead, I have something waiting in the crock pot when we get home. I can’t wait to try this recipe; I think my family will enjoy it! We had it for dinner tonight. My rice wasn’t done. I also had to add an extra cup of water part way through because all of the liquid was gone. I did add probably a cup of mushrooms, also. So, if I was making it again I’d start out with 4 – 4 1/2 cups of water and cook on low for 6 hours. It may just be a difference of one crock pot to the next, but one my newish one ( less than 5 years old) I need more time. That recipe sounds delish!!! Will def. have to give it a try. Sounds like a yummy recipe. I’d love to win a certificate! This sounds like a wonderful recipe and can’t wait to see if I won. Is the chicken breast cooked or uncooked before adding it to the crockpot? Your homemade recipes all sound so good! However, I’m fighting high cholesterol and cannot use products such as heavy cream or so much butter. Are there any substitutes we can use for these so we can still make your recipes turn out yummy? I’ve made it w/o the dairy to make it like the chicken & rice my grandma made. She always added sliced carrots & celery so Itried it and it worked! You could add some coconut oil in place of the butter. Laura did a post on healthy substitutions. I will include that link! I usually buy onion soup mix at Aldi because there’s say “no Msg” but it sure is nice to know how to make my own. Thanks for the recipe! I cooked this last night and the rice wasn’t cooked after 5 hours. I had to add a lot of water-probably 2 or 3 more cups-and cooked it for 2 more hours (we had to go somewhere). By this time it was a thick mush. It tasted good though. I guess it turned to mush from me opening the lid twice and adding liquid and stirring. My crockpot usually cooks very accurately. Thank you for another great recipe. My kids loved it. I added a can of mushrooms. So easy. Love it! I had the same problem that Morgan commented on (April 27, 2012). This recipe tasted very good. My husband even commented–3 times– that it was “one of the best things you’ve cooked lately”. But the end result was mushy. I tried to use both white and brown rice since we haven’t fully moved over to the brown rice side of the fence. I put in 1/2 white and 1/2 as brown (both were the non-instant kind). I put the white rice in an hour after the brown rice. My white rice was mush by end of recommended cooking time. And the brown rice wasn’t cooked all the way. Kids complained it was “crunchy”- which it was. Do you have any recommendation of how to mix the 2 rices? Or even how to better cook this with only brown rice? Were you using instant brown rice or non-instant? Thanks. work best. Sorry I can’t give exact times! I haven’t tried that before! Could i use a finely chopped onion instead of onion soup mix? If not, what could I sub for the soup mix? Thnks. I love comfort food cookied in the crock pot. Any suggestions for a substitution for the cream? Perhaps powdered milk mixed stronger is what I substitute cream for. Also mix dry powdered milk in my coffee. YUM! Tried this tonight for dinner! It was delicious! How did the rice turn out? I worry it would be either too done or not done enough. So, I just wanted to let you know that I have greatly improved this recipe!! Haha! Honestly, it really is one of my favorites. I’ve made it quite a few times, and every time the flavors are spectacular, but the rice is somewhat crunchy, even though many spots are well cooked, and it always requires more liquid. So today I made it a little differently. Today I put the rice in the bottom, then the chicken (THIGHS, thankyouverymuch) and seasonings,, and added 4 cups of BOILING chicken broth. I cooked on low for a couple of hours, and then one hour before serving, I added one cup of cream. So, so, so, so excellent! Thanks so much! Could you use white basmati rice? How much liquid would be needed for white rice? I would try an equal substitute and see how it goes. Yummy looking!! and it looks easy!! Ok. 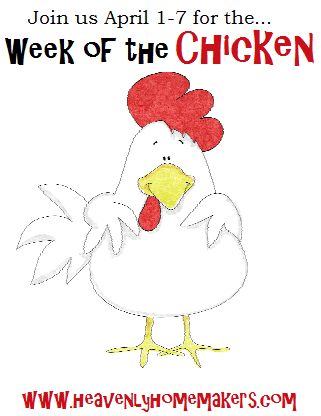 The week of the Chicken made me LOL. Love it. You are so funny! If using bouillon and water, boil water and combine so the bouillon will dissolved. Melt butter in large frying pan. Add rice and noodles and stir constantly as the pasta browns, approximately 2-3 minutes. Remove from heat and carefully add chicken broth and seasonings. Return to heat and bring to a boil. Cover and reduce heat to low. Cook 20-25 minutes or until liquid is absorbed, stirring occasionally. The only caution I have is that if the chicken broth has a lot of fat, it can make the final product very oily. However, you could try using the excess fat to brown the noodles and rice at the beginning of the dish. My family loves this and I love when I can make a dish without preservatives by using my own chicken broth and home grown herbs! Also, I know brown rice is preferred by many, but I don’t use it. I know it takes longer to cook, so I don’t know how the recipe should be adjusted to use it. Good luck! Can you dbl or triple this recipe easily? Yep, I’ve done it and it works great! How would I double this recipe? I see the post where you replied and said it can easily be doubled or tripled but what adjustments? Cook time adjustments to ingredients ect?